I have my grandfather’s adze, although he has died… I also have his carving knife. I think of them, and of him. My grandpa wasn’t the only one who told me important things. I have many grandfathers who used to talk to me. I think about them and in that way try to keep them alive, even though they are gone. The adze and carving knife were essential for transforming wood into kayak frames, paddles, utensils and masks. In the qasgiq (men’s community house) men taught boys how to use these tools. Nick Charles, Sr. said, “They used to advise us and tell us to carve as much as we could on our own, even though it didn’t come out looking perfect. A person doesn’t learn by being idle” (from The Living Tradition of Yup’ik Masks, 1996). 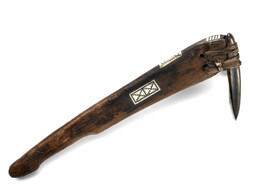 This adze has a polished jade blade and a wooden handle, decorated with engraved walrus ivory.